From a simplistic view, CRE market value is influenced by demand, supply, property utility, and transferability. However, there are a wide range of factors that contribute to those 4 components. These supplementary factors can be grouped into location, market, appraisal, leasing, and building characteristics. Let’s take a closer look at each one of these. Location is always a major factor in CRE values in Boston. From the North End to Fenway, South Boston, and everything in between, every neighborhood features unique characteristics, demographics, zoning, and supply. Thus, pricing and demand will vary greatly, even among adjoining neighborhoods. Local real estate market conditions are another one of the most important supplementary factors affecting CRE values in Boston. Listing volume, competition, average marketing time, absorption rate, interest rates, financing alternatives, and the like must all be considered when pricing CRE in Boston. Although most do not think about appraisals until after a transaction is in progress, it really should not be an afterthought. Appraised value offers valuable insights into a property and can also impact financing of purchases. It is helpful to understand appraisal methods and include that in CRE investment analyses. 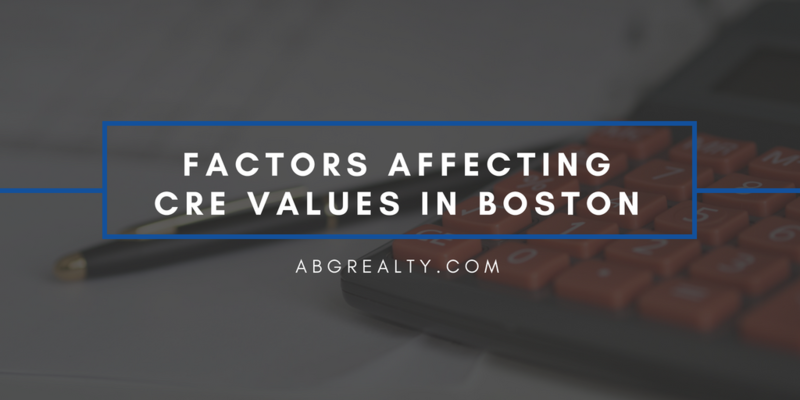 Read our recent blog post for a detailed explanation of the 3 major property appraisal methods for Greater Boston real estate. Business decisions such as lease offerings and terms can also influence CRE property values. When selling a building with existing leases in place, potential buyers will closely review your lease terms and weigh the benefits and disadvantages of those terms to their own business goals. Thus, CRE investors should consider potential resale value when negotiating tenant leases. The above are just a few key examples of supplementary factors affecting CRE values in Boston. The reality is, the possibilities are endless. Social, political, and economic changes can often shift what features are most important at a given time. Thus, it’s important to rely on professionals who work in the industry and understand both local and national influences on CRE values. Contact ABG for assistance with all of your commercial real estate needs.